The trial of the decade returned to court last month, once again taking over our lives. Not since the OJ Simpson trial has one murder case so gripped the world, seeing South African athlete Oscar Pistorius, 29 (Aka Blade Runner) once again back in the news as he returned to court to be sentenced following the murder of his girlfriend model Reeva Steenkamp in February 2013. Pistorius, 29, killed Ms Steenkamp after firing four times through a locked toilet door but has always maintained his innocence saying he believed he was shooting at an intruder. The case has been a drawn-out affair. We’ve already had one trial, verdict, sentence, and appeal. And just this morning, he was sentenced for the second time. Although previously announced that he would face at least 15 years in a South African jail, the athlete was today sentenced to just 6 years in prison, the judge explaining that that there were ‘substantial and compelling’ reasons why he should not serve the full 15. The internet is already at arms, with debates on the sentencing and the previous trial trending on twitter, some users even calling for a second appeal. Here are the 13 key moments in the trial that everyone will be talking about this week. The trial opens at the high court in Pretoria, South Africa, where Pistorius officially enters a not guilty-plea to the murder the previous year. His neighbour Michelle Burger is the first witness to be called in the trial, and tells the court on the night Reeva died she was awoken by ‘a woman’s terrible screams’. Ms Burger claimed she heard four shots with a ‘longer’ gap between the first and second. She described the screams as ‘blood curdling’. March 13 2014: Pictorius vomits in court. Gruesome images from a police computer of Steenkamp shortly after death are accidentally beamed onto TV screens in a packed courtroom. Pictorius is brought a bucket as he begins to retch and vomit during live coverage of the trial. March 24 2014. The incriminating messages. 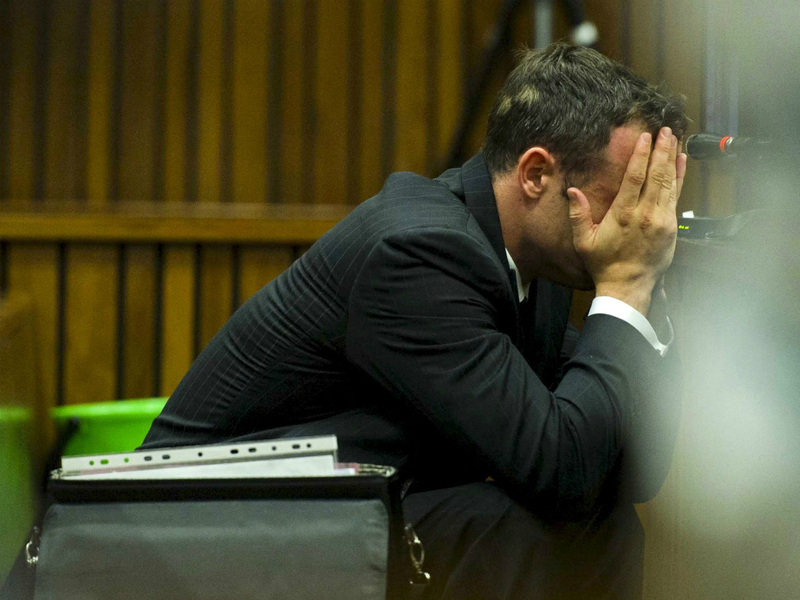 A police captain reads out a text message sent by Ms Steenkamp to Pistorius weeks before she was shot. ‘I’m scared of you sometimes and how you snap at me and how you will react to me,’ she said. The couple had argued after Pistorius had accused her of flirting with another man and the athlete’s wildly jealous streak is discussed in court. Pistorius finally takes to the stand to tell his tearful version of events beginning with an apology directed towards Reeva’s parents describing their daughter’s death as a terrible accident. 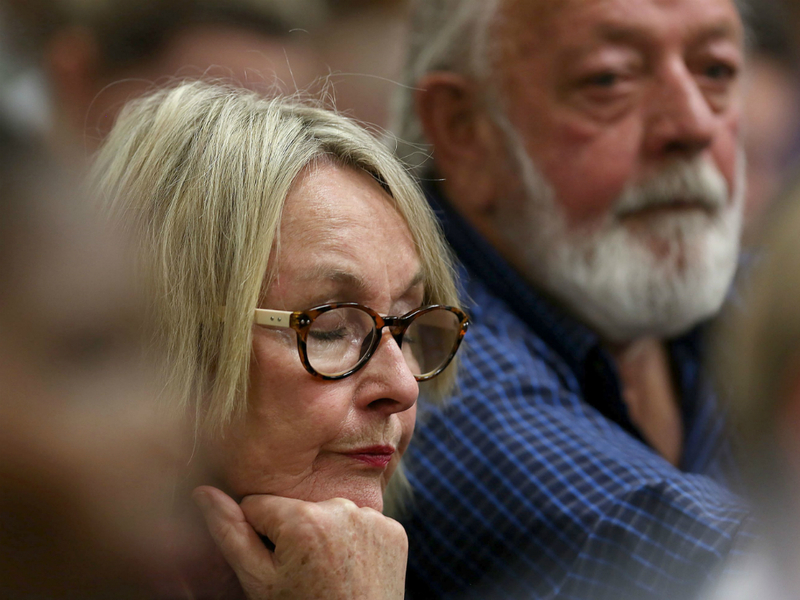 Mrs Steenkamp’s stoic response leads to speculation that she believes him to be guilty. A day later, Pistorius’ lawyer asks the athlete to demonstrate his height without his prosthetic legs. He draws gasps from the court when he hobbles on his stumps to stand next to the bullet holed toilet door, which has been brought into the courtroom. His head reaches to a few centimetres above the door handle. 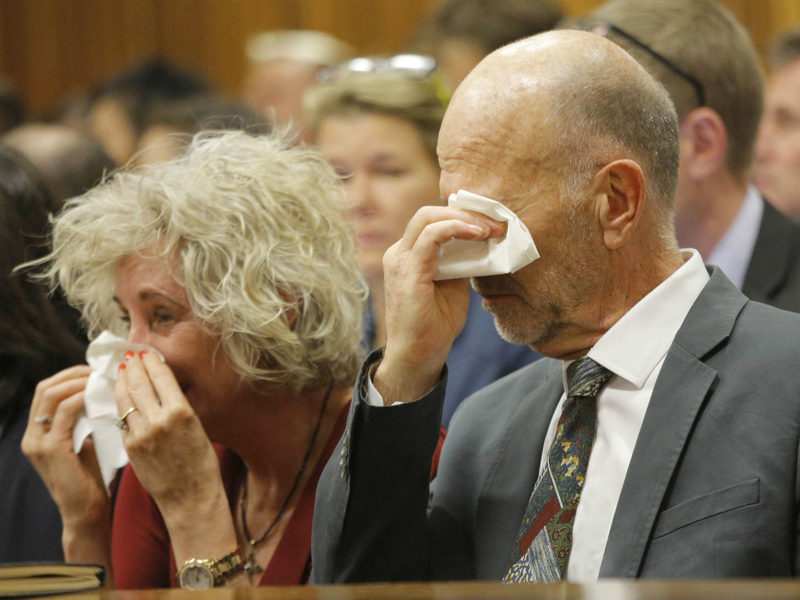 The defense team say Pistorius’ tears are self pity not genuine remorse. April 9 2014. Pistorius’ passion for shooting and short temper is revealed. Defence forensic psychologist Merryll Vorster tells the court that Pistorius had suffered from Generalised Anxiety Disorder since childhood – pointing to the amputation of his legs when just 11 months old, the divorce of his parents when he was six and the death of his mother at 15. This is used to explain why he may have over-reacted to the idea of an intruder in his home. Pistorius is cleared of both premeditated and second degree murder. 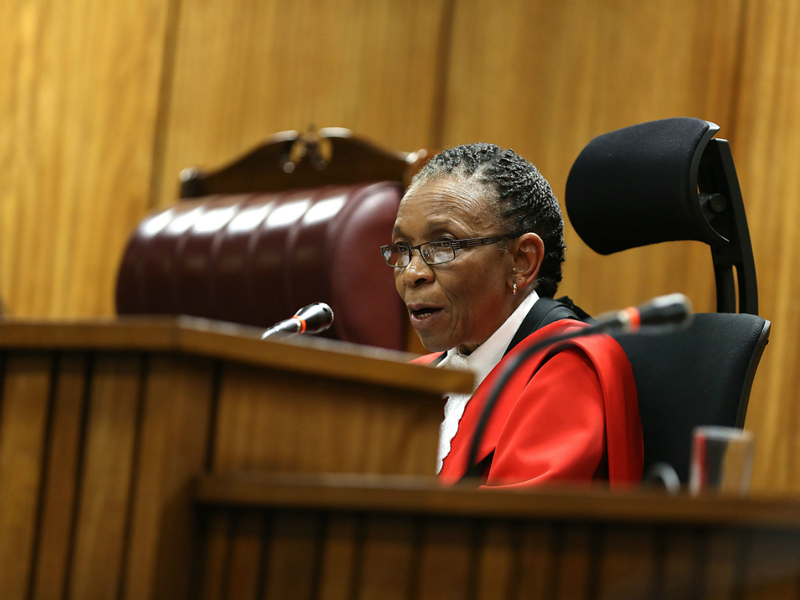 However, Judge Thokozile Masipa described the athlete’s actions as ‘negligent’ saying she was ‘not persuaded’ that a reasonable person with Pistorius’ disabilities would have fired the shots which killed the law graduate and model. The following day, Pistorius is convicted of culpable homicide (equivalent to manslaughter in British law). He is sentenced to five years in prison, some of which could be served under ‘correctional supervision’ – or house arrest – after a minimum of 10 months behind bars. For a separate firearms charge, upon which he was also found guilty, he is given a three-year suspended sentence. Prosecutors file an appeal asking for Pistorius to be tried again over the killing of Reeva Steenkamp – arguing he should have been found guilty of murder. A murder conviction carries a minimum jail term of 15 years in the country. After serving just over a year in a maximum security jail in Pretoria, Pistorius is released to serve the rest of his sentence under house arrest at his uncle’s mansion in Pretoria. 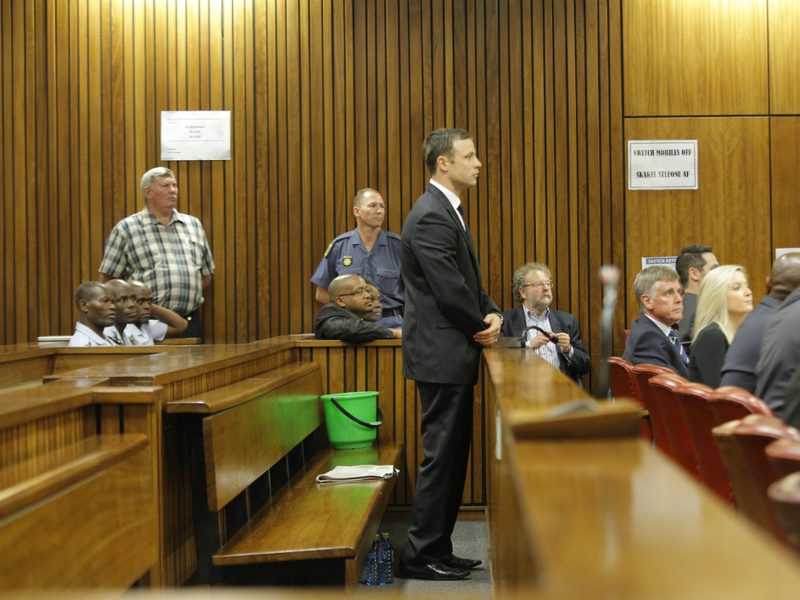 South Africa’s Court of Appeal overrules Judge Masipa and convicts Pistorius of murder. He must now return to court to be sentenced again. June 13 2016: Sentencing of Pistorius begins. He faces 15 years in jail for murder. 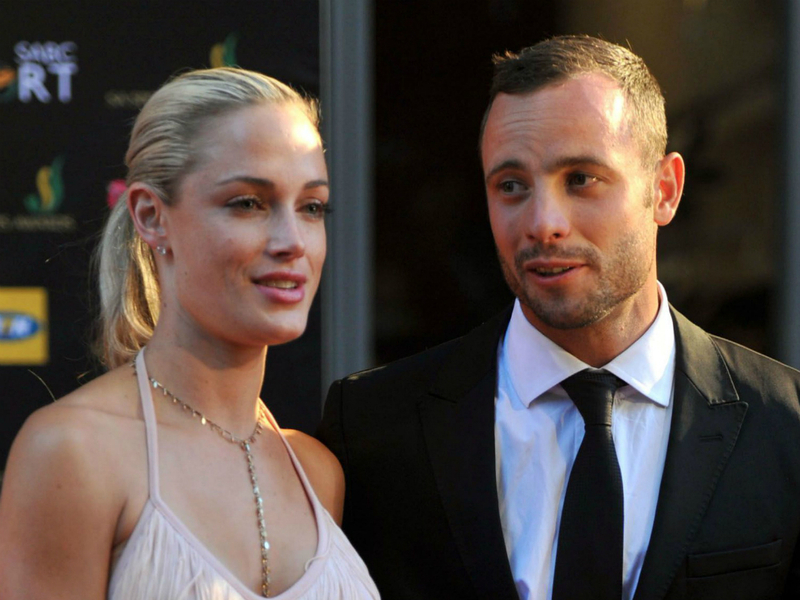 Oscar Pistorius has been sentenced to six years in prison for the murder of Reeva Steenkamp.